Some shelter dogs rescued off the street or from abusive homes or puppy mills will be “shy” or traumatized. There are many reasons why a shy dog would be terrified of its rescuer after you bring him or her home. Usually, giving the dog time to get used to you is the best thing to do. Let the dog come to you. Take note of human behaviors the dog reacts to. Sometimes dogs are frightened of specific types of people – like men with beards, or women wearing a skirt. Or small children. Like humans, dogs will have triggers. We have three rescued dogs in our home. They all vary in their shyness and trauma. The first one was a puppy we picked off the streets. He was about three months old, which is prime socialization time. This is when dogs get used to people and other dogs. This sweet dog, however, while friendly and adoring to his family (us) is very territorial and cautious around men, except for the men in the family. He’s fine women with as long as they give him treats. Our second rescue dog was from a kill shelter. He was dirty, covered with ticks and fleas and terrified of adult men. We chose him because when my teenage son approached the cage, he licked my son’s fingers. It took months before he’d let any adult male near him. It was a gradual, painstaking process. Fortunately he must have been well socialized as a puppy, because he loves people and other dogs and his disposition is the most cheerful of any dog we’ve ever owned. The most recent, shyest dog we’ve adopted is a twenty-pound terrier mix. He was rescued off the streets and taken to the shelter where unfortunately, well-meaning shelter workers scared him further. This dog was “shut down”. He hid in the dog kennel, behind couches, and under chairs. Luckily, the happy dog I described above became his best friend. He shadowed the other dog around and we never pushed him further on socialization than he was willing to go. Now, a year later this little dog, while still cautious and somewhat distrustful, follows me around the house and pokes his nose to get petted and have his chest rubbed. He has a way to go. He won’t let us pick him up or put a harness on him. This little guy is much more traumatized and less well-socialized than either of the other dogs. But he has a sweet nature. Patience is the key and we’re amazed at how far he’s come. Once you’ve gained the trust of a shy or traumatized dog, you’ll gain a lot of pride in yourself and the animal. You’ll have achieved a lot! Here’s a range of links to websites with great advice for how to handle a shy rescue dog in your home. Homeward Trails. This website is a rescue organization full of suggestions and advice from experienced rescuers. They’re based in the Washington DC area, so if you live there, maybe you can donate time. Paw Rescue is another organization dedicated to rescue dogs. 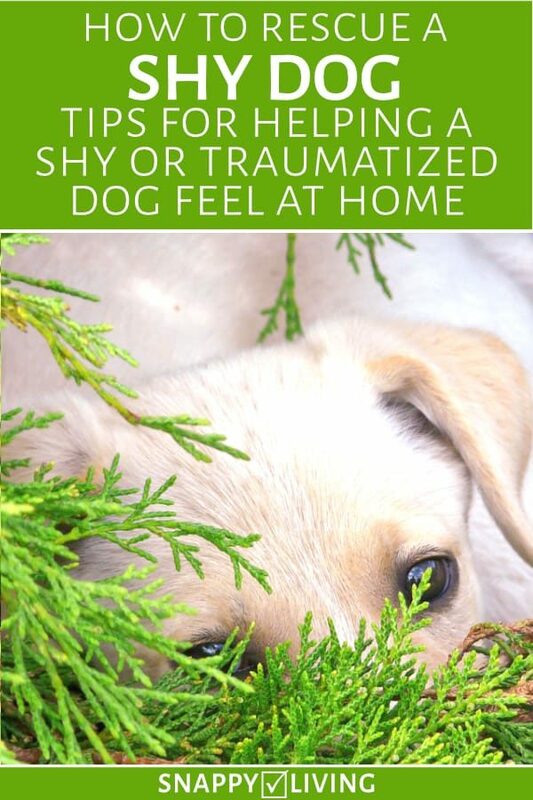 The article about shy dogs on their site includes suggestions on using a helper, and desensitizing dogs who are afraid of particular types of people. They also have great tips on how to raise a puppy without shyness or fearfulness. Fearful Dogs has an article featuring the benefit of playing gentle games with a shy, or fearful dog. The writers of this article include a couple of videos showing what they do with the shy dogs. These are calm, targeted games. iHeart Dogs features five things you can do to help your shy dog (but perhaps not a traumatized dog). Walking, playing, agility games – mostly spending time with the dog and making the dog feel secure. The best advice is the last item. Check it out. A Better Dog for You has more takes on helping out a shy dog. Toward the bottom of the article the author mentions severe cases in which a dog has “shut down”. It’s worth reading through to the end. If you want to try treats for your shy dog, observe them first. Are they a terrier breed? Or a hound or hunting dog or a working dog? Is food an obsession? Here’s a quick list of treats and toys you might want to try. For the food obsessed canine afraid he’ll never get food again check out the Outward Hound Slow Feeder bowl. There are different designs and sizes available, for all sizes of dogs. Why would you want to get your dog a slow feeding bowl? Some dogs are prone to bloat (a condition that can kill). And until your dog realizes it won’t run out of food, and you have other dogs, this is a great way to slow him down so he finishes at the same time as your other dog. Tiny treats can be super tasty and motivating for your shy dog. Zeke’s Tiny Duck Dog Treats are a hit with our dogs, although they’re particularly fond of bacon flavored treats, too. Again, look around. Our dogs weren’t so thrilled with certain brands. Like humans, they have their own tastes. And you want to motivate your shy dog to come to you. Chewers will love these (our shyest dog will chew through one in a week): Nylabone offers tons of options for dogs who love to chew, from the smallest Chihuahua to the largest Great Dane. Here are a few choice dog toys. Research your breed and get to know your individual dog. This squeaky squirrel toy is the absolute favorite of one of our dogs. He walks around with it in his mouth, squeaking it. It’s hilarious. Great for dogs with a prey drive, or who just like to squeak around the house. There are similar chipmunk-sized toys for small dogs, too. The Chuckit! Ball Launcher is a classic ball tossing toy. You can use the ball it comes with, or use it with tennis balls. It comes in different lengths. Highly recommended for ball chasers. If you have a large yard or go to dog parks, this is ideal. A shy dog needs a lot of patient TLC, but once you’ve gained their trust, you have a friend for life. For a dog you’re having an especially hard time with getting it out of its shell, don’t hesitate to call a dog behaviorist. Your vet may have suggestions.